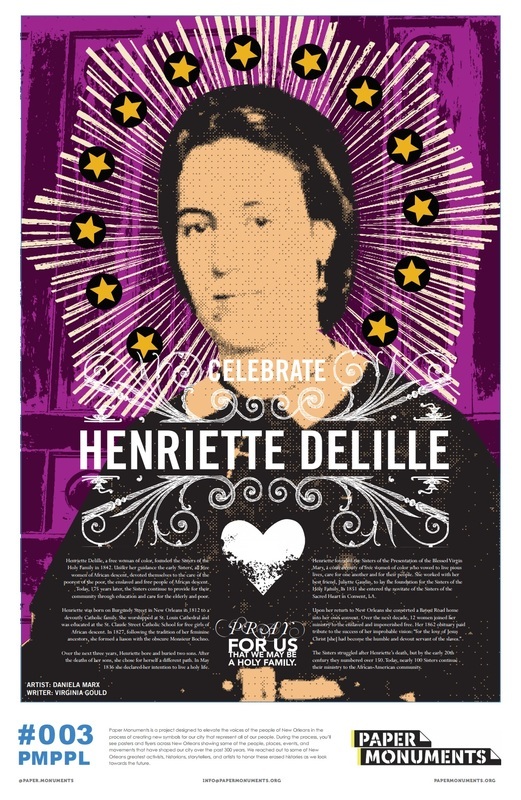 Paper Monument Project #003: Henriette Delille, a free woman of color, founded the Sisters of the Holy Family in 1842. The sisters were devoted to the care of impoverished enslaved people and free people of African descent. Henriette Delille, a free woman of color, founded the Sisters of the Holy Family in 1842. Under her guidance the early Sisters, all free women of African descent, devoted themselves to the care of the poorest of the poor, the enslaved and free people of African descent. Today, 175 years later, the Sisters continue to provide for their community through education and care for the elderly and poor. 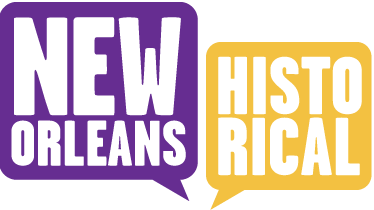 Henriette was born on Burgundy Street in New Orleans in 1812 to a devoutly Catholic family. She worshiped at St. Louis Cathedral and was educated at the St. Claude Street Catholic School for free girls of African descent. In 1827, following the tradition of her feminine ancestors, she formed a liaison with the obscure Monsieur Bochno. Over the next three years, Henriette bore and buried two sons. After the deaths of her sons, she chose for herself a different path. In May 1836 she declared her intention to live a holy life. Henriette founded the Sisters of the Presentation of the Blessed Virgin Mary, a confraternity of free women of color who vowed to live pious lives, care for one another and for their people. She worked with her best friend, Juliette Gaudin, to lay the foundation for the Sisters of the Holy Family. In 1851 she entered the novitiate of the Sisters of the Sacred Heart in Convent, LA. Upon her return to New Orleans she converted a Bayou Road home into her own convent. Over the next decade, 12 women joined her ministry to the enslaved and impoverished free. Her 1862 obituary paid tribute to the success of her improbable vision: “for the love of Jesus Christ [she] had become the humble and devout servant of the slaves.” The Sisters struggled after Henriette’s death, but by the early 20th century they numbered over 150. Today, nearly 100 Sisters continue their ministry to the African-American community. Paper Monuments, Daniela Marx, Artist, and Virginia Gould, Narrative, “Henriette Delille,” New Orleans Historical, accessed April 24, 2019, https://neworleanshistorical.org/items/show/1390.